In the last edition of Mountain Views, I finished the article, noting that a lot was happening on this subject. Unfortunately, since then, things on the campaigning front have been rather quiet and things on the destroying front have been unhealthily active. 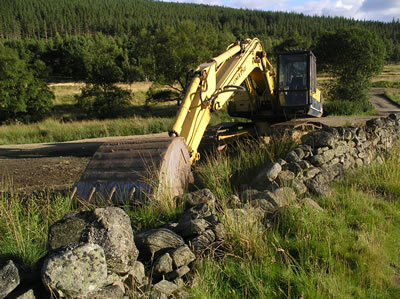 Invercauld estate has continued to stall on the issue of their crudely bulldozed tracks in the Slugain Glen, built without planning permission. They have successfully procrastinated on the site meeting with the contractor and nothing has happened. To make matters worse, they have continued to show total contempt for the planning laws and have started another front, this time, hacking a track, north of Inver, from Balmore to Auchtavan (picture). They seem determined to make a laughing stock of the planning system. The Cairngorm Park Authority remains silent, probably too busy building park boundary markers. We shall continue to object, working with Scottish Natural Heritage to see what can be done and trying to get Aberdeenshire Council to take its responsibilities seriously. There is, at least, one precedent for refusing planning permission and getting an estate to remove an illegally built track. Aberdeenshire Council seem unwilling to use the powers at their disposal. Getting the Park Authority to take a more active role is also a priority. At the NEMT, we have been consulting on our proposal to seek funding to look at the whole issue more holistically. Can we find ways of encouraging estates to stop building new tracks? Unfortunately, this consultation has gone painfully slowly. Hopefully, there will be more substantial progress to report in the next edition.